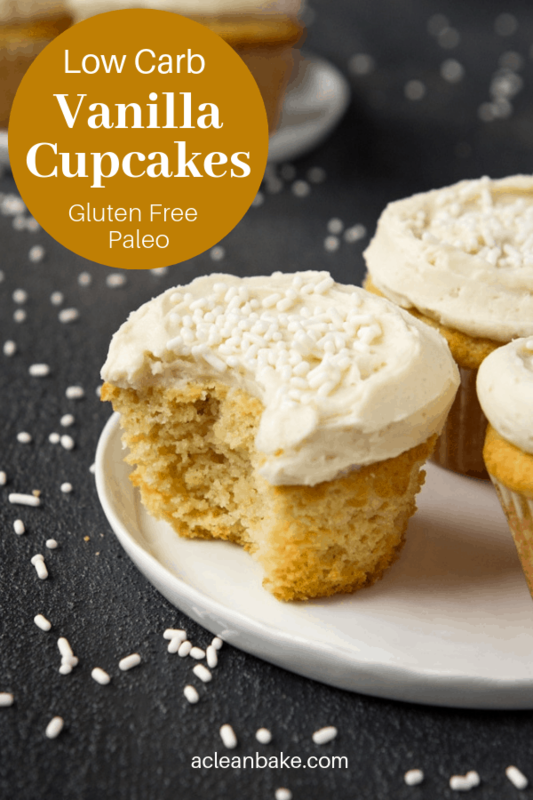 These low carb paleo vanilla cupcakes are lower carb and gluten free, but they are still easy to make and guaranteed to please a crowd! In general, I’m a very boring person but today I’m going to cause a stir, so I may as well get it out of the way now. Are you holding on to your hats? Yeah? Ok, cool. The frosting on these cupcakes is from a can. You read right: A. CAN. Hats still in place? Excellent. So, before you lose all faith in me, let me fill in the blanks a bit. A while ago, my friends at Simple Mills (<– that’s not a euphemism or an exaggeration; the awesome people at Simple Mills really have, over the last couple of years, become friends.) let me in on a little secret: they were working on a real food frosting line. It makes sense, right? As the people who do cakes and cupcakes so well, the next logical step had to be frosting. A couple of months later, a small box arrived at my doorstep and when I opened it, it was like in the cartoons, when the character opens the treasure chest and a bright light shines up on to his face: Frosting!! Right now, it comes in two flavors – chocolate and vanilla – and while the chocolate is, quite literally, good enough to eat straight out of the jar (errr…. a friend told me ;)) the vanilla really peaked my interest because chocolate frosting is easy enough to make with a perfectly ripe avocado, but avocado-green vanilla frosting doesn’t quite work for a variety of reasons. A word of warning for those of you dealing with sugar intolerance, candida or similar issues: this frosting contains powdered organic cane sugar. For proper flavor and, more importantly, texture, there is simply no way around it. I’ve certainly had success making sugar-free frosting, but for smooth, perfectly creamy frosting, powdered sugar is the way to go and I haven’t found a suitable sugar-free powdered sweetener. For what it’s worth, I am still relatively sensitive to sugar and the amount of sugar in Simple Mills frosting hasn’t been an issue for me. But with all of the excitement around the frosting, I am concerned that the cupcakes themselves are getting the short end of the stick. I originally made this recipe to bring to the going away party for our neighbors who – and I’m still in denial about this, so I’m not completely ready to admit that this happening – are moving to Florida next month. They were a hit. But, because I am very serious about the recipes I post here being the best they possibly can be, I’ve tweaked and re-tested these fourteen million more times since then. 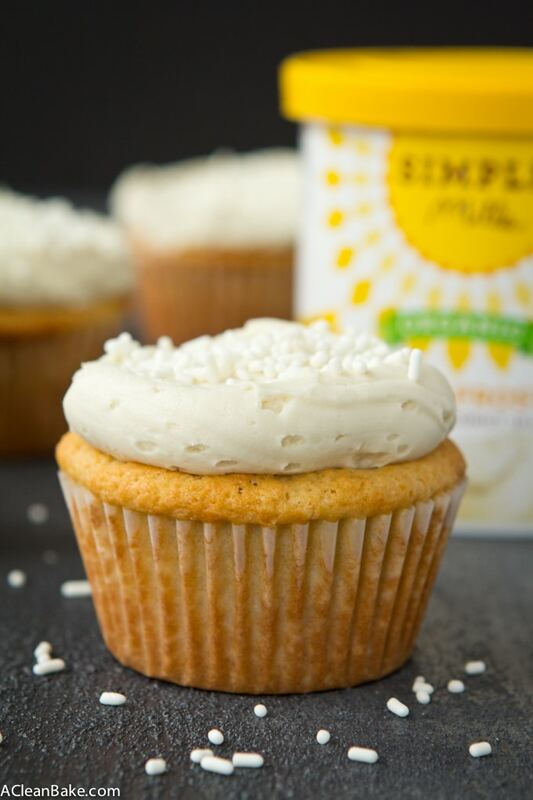 They may seem like simple vanilla cupcakes, but you and I both know that the simplest recipes mean every flavor, ingredient and step counts. Room temperature ingredients, particularly the eggs, play an important role. Cold eggs won’t incorporate well, so try to remember to take them out of the fridge a couple of hours in advance, or soak them in warm water for about 10 minutes before using them. The same goes for the yogurt; if you can at least take the edge off of it rather than using it straight from the fridge, that is ideal. Speaking of the yogurt, make sure you are using plain (unsweetened/flavored), non-fat or low-fat Greek. I tested this recipes with Fage brand 0% and 2%, but if you can find a non-dairy Greek yogurt, that should work fine too. I haven’t tried it with regular (non-Greek) yogurt, so do so at your own risk. I can’t imagine it will be a catastrophe, but since regular yogurt has more moisture than Greek, you’ll probably have to increase the baking time a bit, and may have slightly denser cupcakes. 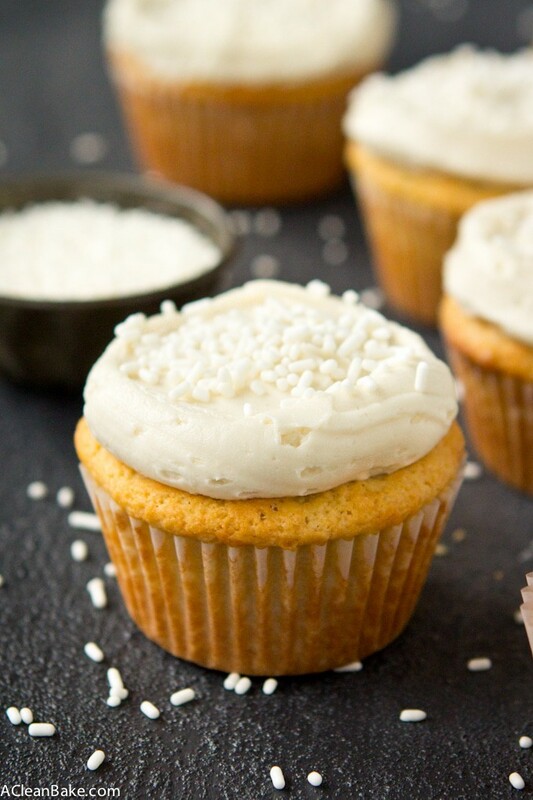 For the liquid sweetener, you can use honey or maple syrup, but if you use maple syrup, the cupcakes have a very faint maple-y taste to them. It’s not terribly strong and isn’t noticeable once you frost them, but just warning you! If you don’t have or can’t use tapioca starch, you should be able to sub arrowroot starch with no noticeable difference. The baking temp may look tricky, but basically here’s what you do: preheat the oven to 375 and, as soon as you put the cupcakes in, immediately reduce the heat to 325. Starting with high heat encourages the cupcakes to rise higher and faster, but you don’t want to keep it at that high temp because the outsides will dry out or burn before the insides are cooked through. Lowering the heat allows the cupcakes to cook evenly after they’ve gotten the rising benefits of the initial burst of high heat. I hope I am not making this recipe sounds high maintenance because it’s not. 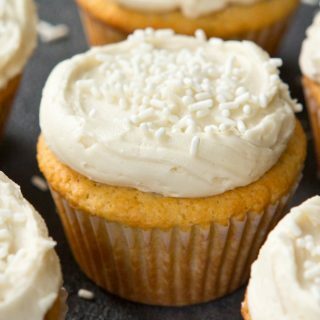 It’s a quick cupcake that requires two bowls and a spoon to whip up, and you can’t argue with the efficiency of a can of ready-to-use frosting, either! Vanilla frosting of choice. I recommend Simple Mills! Preheat the oven to 375F and line a 12-cup cupcake tin with papers. Set aside. In a medium mixing bowl, whisk together the almond flour, tapioca starch, stevia, baking soda and salt. Set aside. In a large mixing bowl, whisk the eggs, then whisk in the yogurt, honey/maple syrup and vanilla. Add the dry ingredients (almond flour mixture) and whisk until fully combined and no clumps remain. Divide the batter between the 12 compartments in the prepared cupcake pan. Put the pan in the oven, close the oven door and immediately lower the temperature to 325F. Bake for 18-22 minutes until the cupcakes are domed and firm to the touch. Allow to cool for 10-15 minutes in the pan before transferring to a wire rack to cool completely before frosting and decorating. 1) Room temperature ingredients, particularly the eggs, play an important role. Cold eggs won't incorporate well, so try to remember to take them out of the fridge a couple of hours in advance, or soak them in warm water for about 10 minutes before using them. The same goes for the yogurt; if you can at least take the edge off of it rather than using it straight from the fridge, that is ideal. 2) Speaking of the yogurt, make sure you are using plain (unsweetened/flavored), non-fat or low-fat Greek. I tested this recipes with Fage brand 0% and 2%, but if you can find a non-dairy Greek yogurt, that should work fine too. I haven't tried it with regular (non-Greek) yogurt, so do so at your own risk. I can't imagine it will be a catastrophe, but since regular yogurt has more moisture than Greek, you'll probably have to increase the baking time a bit, and may have slightly denser cupcakes. 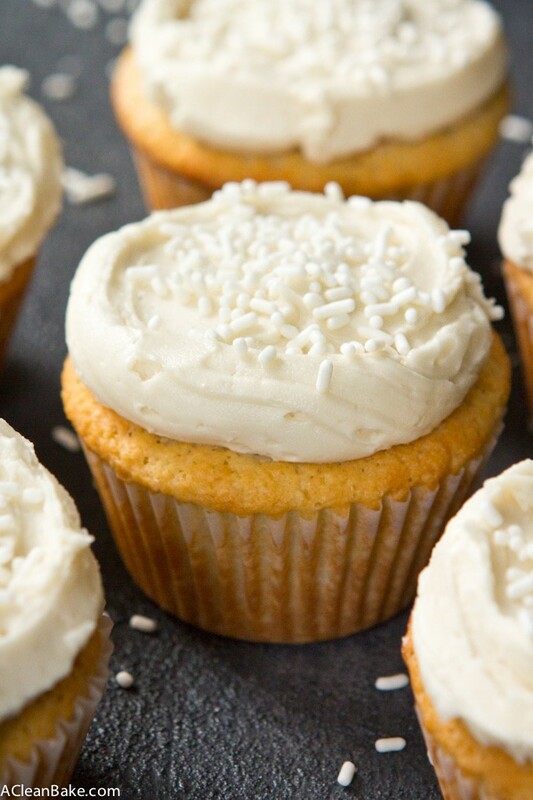 3) For the liquid sweetener, you can use honey or maple syrup, but if you use maple syrup, the cupcakes have a very faint maple-y taste to them. It's not terribly strong and isn't noticeable once you frost them, but just warning you! 4) If you don't have or can't use tapioca starch, you should be able to sub arrowroot starch with no noticeable difference. 5) The baking temp may look tricky, but basically here's what you do: preheat the oven to 375F and, as soon as you put the cupcakes in, immediately reduce the heat to 325F. Starting with high heat encourages the cupcakes to rise higher and faster, but you don't want to keep it at that high temp because the outsides will dry out or burn before the insides are cooked through. Lowering the heat allows the cupcakes to cook evenly after they've gotten the rising benefits of the initial burst of high heat. 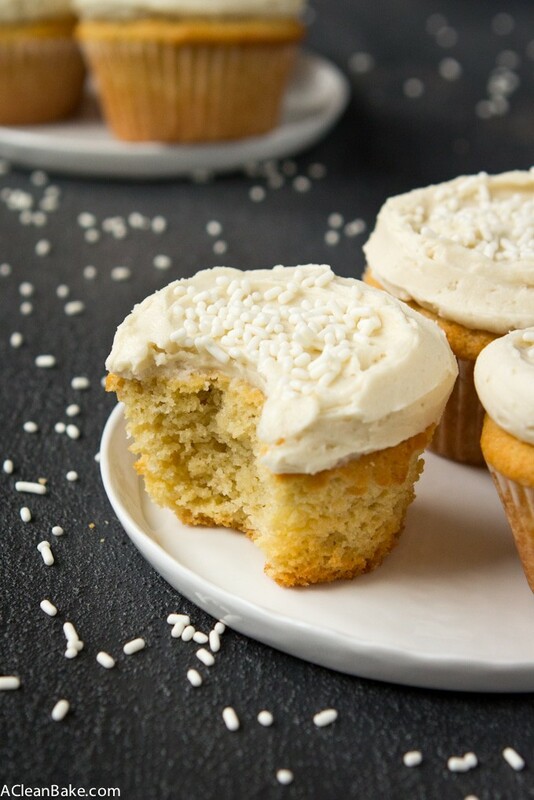 These cupcakes are gorgeous and I can’t believe they’re under 200 calories a pop! Whoa! Thanks! I know, unbelievable, right? And low(er) carb, too! I have always wanted to try Simple Mills, I have heard so many great things about them! These cupcakes looks incredibly moist and fluffy at the same time, yum! Are these still considered Paleo if they call for yoghurt? Yes, you can use grass fed cow’s milk yogurt (if you tolerate dairy) or a non dairy alternative. But if you’re using regular non-Greek yogurt, please make sure to read the recipe notes before you start mixing. Can you use regular Almond Flour? Or a substitute? Cannot find Blanched Almond Flour except on Amazon and need to make these today!? Hi Sharon! You can definitely use unblanched almond flour. Just know that if the almond flour is brown, the cupcakes will be too (they will also have a slightly nuttier taste because the almond skins are included). Blanched will be an off white/yellow color, but it may not be labeled blanched almond flour. Bob’s Red Mill is one of the brands that is available in most supermarkets, and it is blanched (off white/yellow color), but I don’t think it is labeled as such. Good luck! One last question – I’m brand new to this way of cooking & eating – my son has a bunch of allergies and so we’ve eliminated everything practically! So appreciate your site and all the great recipes! The instructions call for whisking the ingredients. Whisk? or beat with beaters…. Hi Sharon! Yep, the color difference is due to the skin of the almonds (whether it is removed prior to grinding into flour, or left on and ground with the meat of the nut). It affects the texture and taste *slightly* so I always use blanched almond flour (Honeyville is my go-to brand, and I get it in big bags on Amazon—> http://amzn.to/2xdXkZ8). Oh man, those allergies are tough! I’m so glad you found the site. Hopefully there is plenty here that you and your family can enjoy! Oh and yes – you can definitely beat 🙂 Almost all of the baked goods recipes are made in a bowl with a spoon/fork/whisk to mix, but you can do it with a hand mixer with the beater attachments if you prefer! The batter tastes amazing!! I can’t wait until they are done baking in the oven. Thanks for this simple but tasty recipe.